Lately I have been speaking in high terms of the French metal scene that has recently often surprised with interesting new bands. But unfortunately there are also black frogs, oops, pardon my French: sheep. One of them are Nightmare who try to entertain us with their already seventh studio album Insurrection. Their music is unfortunately just as exciting as their band name which is shared by at least a dozen other metal bands all over the world. At least the Alps rockers have been around since 1979 which should give them the right to their name. This doesn’t change the fact that Insurrection is full of average songs. Although you won’t find truly bad stuff, you will also look in vain for a highlight. 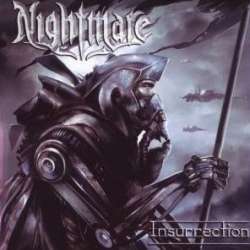 Nightmare pretend to be a power metal band, which lets you expect a straightforward rocking metal band. This is alas only occasionally the case, and never over the course of an entire song. Some pieces, like Three Miles Island and Target For Revenge, have even become too tame. There are some interesting touches, like the lively start into Cosa Nostra that reminds a little of Savatage, or the nicely placed breaks of the title track, but overall the band just lacks sparking ideas. Overall it can be said that they rarely surpass the heaviness of melodic power metal bands like Axxis, Primal Fear, Edguy and Grave Digger, and that’s just too little for those into meatier metal. Fans of better behaved heavy metal might enjoy the CD that comes with a pleasantly transparent production, but the more hardened metal fans should make a detour around Insurrection.